In a small country like the Netherlands there’s a large regional cultural diversity. Even the manufacturer of an everyday object such as the bicycle has to take this in account. A version of the classical lady’s bike with holes in the mudgear/ fender to attach the handmade coloured ‘cyclenets’ (dress guards) existed for a long time in Staphorst. A bicycle that was adjusted to the local needs! Of course I wanted to see this bike with my own eyes, but first I was curious which manufacturer made this Staphorster bike. Google being a good friend, I searched for ‘Staphorster fiets’ and ‘Staphorster variant’, ‘Staphorst model’ in combination with the words ‘origin’, ‘history’. What I found was lots of information on the dress guards. Those dress guards…well, they are works of art. Cycling in Staphorst is and has always been done on a black omafiets or granny’s bike. It was easy for the women with their long skirts to get on the bike thanks to the step-through frame. The only problem was that their skirts got ruined because they kept getting into the spokes. Inventive as the women were they found a solution to this: dress guards. If you see dress guards on a bicycle nowadays they’re usually made of plastic. The Staphorster women made and still make their dress guards themselves. They crochet different creations in all colours and patterns. If you know a bit of Dutch you can find an original pattern here. Is your Dutch not that good and still want to get an idea on how to crochet your own dress guard? Find an English crochet pattern here. For the non-crochetters: you can also order them on Simeli. An employee at Velorama, the bicycle museum in Nijmegen, told me that a local dealer would make little holes in the omafiets to attach these crochetted creations. Blue-red ones were for daily use, green-black ones for mourning periods. After all this reading about the Staphorster bike I still hadn’t found what I was looking for: the manufacturer of this version of the classical lady’s bike. So, it was time to visit Staphorst, the small town in Overijssel where time has stood still. The town with the low straw-roofed farmhouses with traditional green doors and green wooden window shutters. The town where women still ride their black omafiets in traditional folk costume. 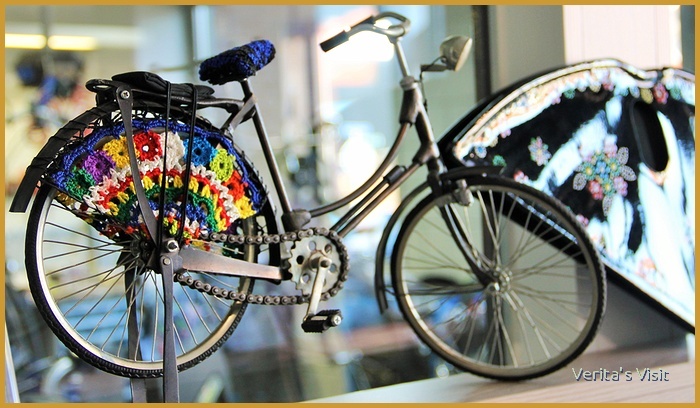 The traditional granny’s bike -omafiets- with Staphorster dress guards – fietsnetten-. Did you go to Staphorst and managed to take a picture of a Staphorster lady in folk costume riding her bike? Please share it here, I would love to see it!